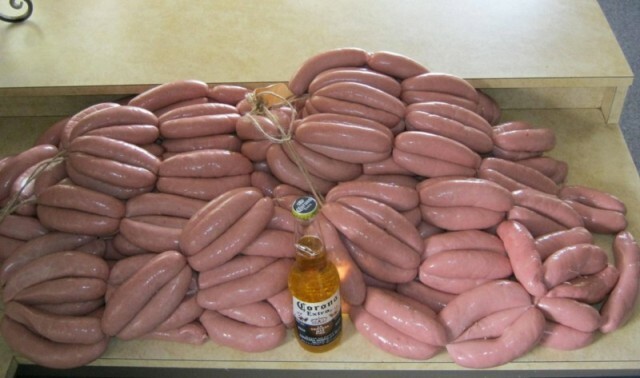 I've got a few kilos of mince from a small boar and was thinking of making some sausages. Never made any sort of sausage before so any recipes and general tips on the art of sausage making would be hugely appreciated. This was my last effort of wild pork snarlers, I just keep it simple, a bit of pepper, salt, perhaps a touch garlic if your inclined. they taste to good to mess around with a lot of spices which will disguise the flavour. Arrow root powder or milk powder makes a good binding agent. 100% Pork, don't add any crap like bread crumbs or stuff like that. veitnamcam, ebf, Pengy and 1 others like this. How much binder per kg of meat do I need. I looked in the link you posted but couldn't find it. This is another link I get my info from, there are so many different things you can use as a binder, just use what you can get the easiest. 1-2% binder or around 2oz per 25 pounds of meat, Arrow root works well. soy, vegetable protein powder. instead of adding water or vinegar as some recipes suggest, you can try wine, for venny a sweet red wine is nice. I have only ever made plain pork sossys with salt and pepper.